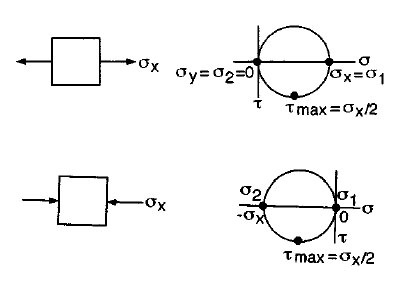 The equations for plane stress transformation have a graphical solution, called Mohr’s circle, which is convenient to use in engineering practice, including “back-of-the-envelope” calculations. The positive axis is downward for convenience, to make on the element and the corresponding 2 on the circle agree in sense (both counterclockwise here). 1. The center C of the circle is always on the axis, but it may move left and right in a dynamic loading situation. This should be considered in failure prevention. 2. The radius R of the circle is , and it may change, even pulsate, in dynamic loading. This is also relevant in failure prevention. 3. Working back and forth between the rectangular element and the circle should be done carefully and consistently. An angle on the element should be represented by 2 in the corresponding circle. If is positive downward for the circle, the sense of rotation is identical in the element and the circle. 4. The principal stresses 1 and 2 are on the axis ( = 0). 5. The planes on which 1 and 2 act are oriented at from the planes of x and y (respectively) in the circle and at in the element. 6. The stresses on an arbitrary plane can be determined by their and coordinates from the circle. These coordinates give magnitudes and signs of the stresses. The physical meaning of + vs. – regarding material response is normally not as distinct as + vs. – (tension vs. compression). 7. To plot the circle, either use the calculated center C coordinate and the radius R, or directly plot the stress coordinates for two mutually perpendicular planes and draw the circle through the two points (A and B in illustration above) which must be diametrically opposite on the circle. (similar to the case of pure shear).